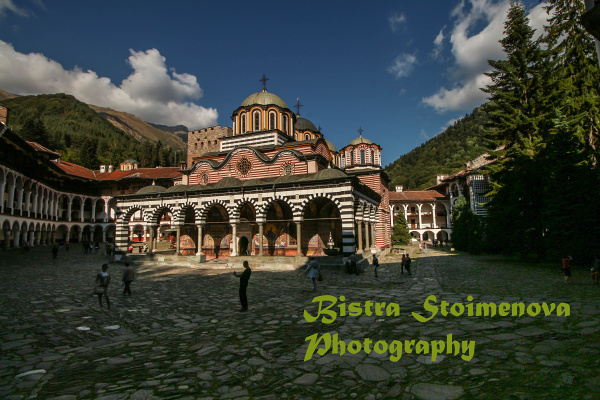 Today I'm gonna take you to Rila Monastery - the biggest monastery on the Balkan peninsula. It is situated in the Rila mountains next to the Rila town. If you are traveling from Sofia - you'll have to drive for about two hours - there is a new motorway. In case you don't know where to turn - at the point together with the brown road signs (which indicate a place of cultural significance and hence - a tourist attraction) there is a big stone statue of St. Ivan Rilski - the patron saint of the monastery, a miracle worker and patron saint of Bulgaria as well. I can't show you a picture because it never crossed my mind that I should. Next time, maybe. Since it is a favourite place of mine, you will see several posts about it - I will try to tell you different things about it each time. The first thing you need to know is that is an ORTHODOX CHRISTIAN (EASTERN ORTHODOX I mean - think of Greece and Russia and you'll get the point) monastery so there are a few things you should know BEFORE you go there. - Shorts, strapless tops or dresses (or such with straps altogether), short dresses are STRICTLY FORBIDDEN. It is considered an offense to God and the church to go in like that so they will either give you a scarf to tie around yourself or tell you that you cannot enter. You need to be wearing a top with sleeves (short at least but sleeves). Low cut clothes are also forbidden for the same reason. THE WHOLE THING ABOVE GOES FOR BOTH SEXES AND ALL WEATHER CONDITIONS!!! It doesn't matter if it is 40 degrees Celsius outside - you should show respect no matter what. - Unlike Greece, where they will make you wear a skirt, even if you are in long jeans, or Russia - where they make you cover your hair - here no such things are needed. You just need a skirt at knee length at least or long pantaloons and a top with at least the hint of sleeves and no low cut neck line. Snapping is a disease sometimes so you should be careful where do you take your camera out! 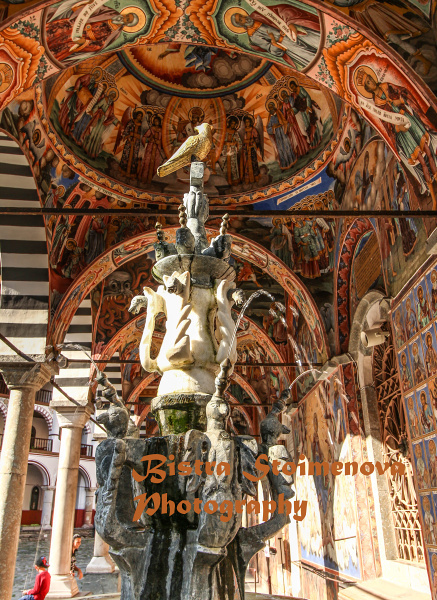 - Taking pictures INSIDE MOST CHURCHES AND MONASTERIES IS FORBIDDEN UNLESS YOU ASK FIRST. Sometimes they will say it's OK as long as you do not disturb the other people (which means - NO FLASH) but in most times it is strictly forbidden unless it is a very big holiday (when everyone has a camera) or a wedding/ christening etc. 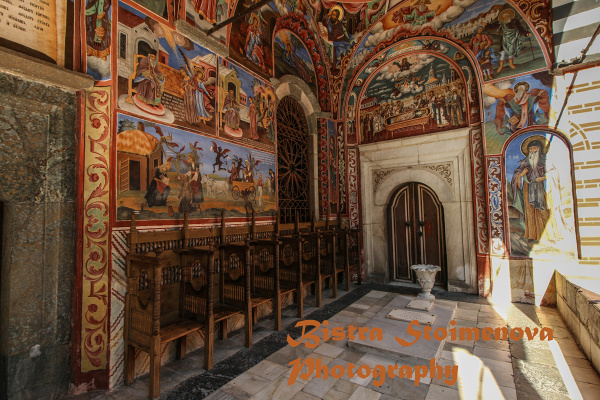 In Rila Monastery you cannot take pictures inside. Orthodox Christian churches have very little to do with Catholic ar Protestant ones. - You will see chairs in the church along the walls but they are NOT for sitting. They are intended for those who cannot stand on their own or are too sick to do so. Unlike Catholic churches - here you pray on your feet, not on your knees. So, don't sit unless you feel faint. - BEWARE OF CANDLES - everyone who goes inside the church to pray lights a candle or many. The custom is that uneven numbers (1, 3, 5 etc) are for the LIVING and even ones (2, 4, 6, etc.) are for the DEAD. Keep that in mind if you want to do what everyone else is doing. For the living you place you candles on your eye level - there are many candelabras, don't worry - and for the dead - above ground in SAND (In Greece it's all in sand - guess it's because it's easy to clean and they have a lot of it). What I was trying to say is that candles are most often made of wax which is very hot as it melts and can ruin your clothes and gear if you are not careful. Also - if it is a big holiday - there are a lot of people with candles around you so BEWARE OF CATCHING FIRE - hair and clothes from artificial materials are prone to that. - Be respectful - don't get in the way of monks/ preachers etc. They have their won work to do and tourists are none of their concern - there are tour guides for that. DON'T LAUGH AND TALK IN A LOUD VOICE INSIDE! You interrupt others and make noise and it is generally bad behavior. - Icons and frescoes CANNOT (in most cases) be touched! You can ruin them by accident. Some of the frescoes with a fountain. - Be careful with oxygen - when candles burn, they use up the oxygen in the room so if you feel dizzy - go outside IMMEDIATELY. carbon mono-oxide is not to be trifled with. 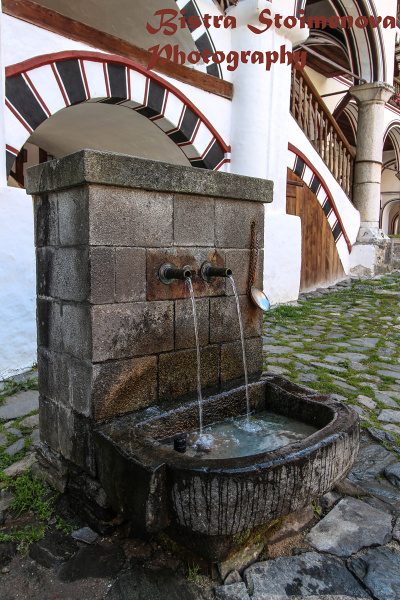 Here you can get water - it's not only potable but one of the best tasting in the country. So, after we got trough the preliminary - what about the monastery itself? Or the saint? Posted by Bistra Stoimenova at 14:27 ч.